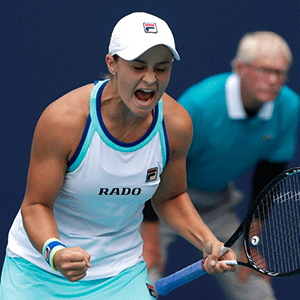 Miami - Ashleigh Barty's transformation is complete after the Australian defeated Czech seventh seed Karolina Pliskova 7-6 (7/1) 6-3 on Saturday to win the biggest singles title of her career at the WTA Miami Open. "It has been a phenomenal two weeks both in singles and doubles," said Barty, who lost a women's doubles semi-final alongside Victoria Azarenka. The 27-year-old Czech came into the final with 31 aces, most in the women's draw, but she won only 65% of points on her first serve compared to 86% from Barty. Barty then began to settle down and crisply struck a forehand winner to breal Pliskova for the first time.